IQPC create leading events for business leaders around the world. They specialise in understanding an industry or market sector, getting under its skin, and then building conference content that will enrich it, help it communicate, and create business value at both an individual and corporate level. As an event organiser that organisers many events a year, they understand the power of conference and leadership events, and how to curate them to create maximum value for their audiences; all of whom pay, and all of whom see these events as a 'must attend' experience worth travelling around the world for. It was therefore a major feather in the cap of Twickenham Stadium when the company looked to the venue to host one of its key conferences; International Armoured Vehicles. This is an incredibly important conference with a high-profile delegate list and a focused audience of 400+ global opinion leaders. The conference had achieved incredible success, growing out of previous venues, but with an ambition to stay in an intimate space, easily accessible by a global delegation, and with the facilities to give them a premium experience. 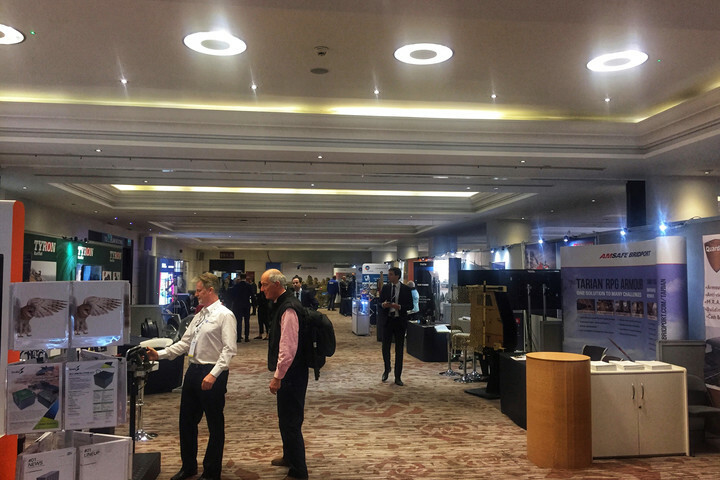 "There comes a point for many conference organisers when they hit that 4-450+ attendee marker and over 40-50 exhibitors, and need to decide whether to go to a small part of a huge exhibition venue, or continue to retain your intimate conference feel in a smaller hotel style venue," commented, John Geenty, Managing Director, IQPC UK. "Twickenham Stadium sat nicely within the two options, large enough to give us space to grow and expand, nice enough to give our guests a pleasant experience, but without rattling around in a major convention centre." For this event, the requirements were very particular, IQPC needed a central auditorium, space for an adjacent expo, room and access enough to bring in large scale armoured vehicles, and multiple break out spaces. Twickenham Stadium's key Live Room and Rose Suite rooms served this need perfectly, with breakout rooms in abundance throughout the wider 'South Stand' facility. While for the team at IQPC the main objective was to get the right venue space and facilities, it wasn't lost on them the opportunity to link in with the Twickenham brand either. "The decision has to start with facilities, and we were pleasantly surprised by the amount of space - both central and plenary - at Twickenham Stadium. However, given our audience we also saw very early on the chance to link them into brand Twickenham"
IQPC events are successful because they focus on the content and the outcomes of their events. Delegates need the right space to soak up the content and then discuss it with their peers, and this was all available at Twickenham Stadium. Outside of the main venue space, they also had a location that was private while close to the major London transport hubs be they plane, rail or road. After that they could drop subtle nods to their delegates of the wider environment they were in, and influence them in a more subconscious way. "For this event, the majority of the delegates are military of military background, so we were able to link in heavily with the sporting side of things. It's always been a strong link and it means they could see a genuine attraction outside of the conference, but also draw inspiration from the heritage and history of the stadium and all its sporting and lifestyle connotations." Not everyone that comes to Twickenham immediately cares about the heritage of the stadium, organisers need great facilities first and foremost; however, once they have the space they need, they can connect with the emotion of the venue to give their guests that extra memory on top of an already enriching experience.